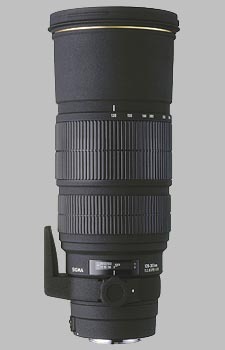 (From Sigma lens literature) This lens represents a revolutionary leap forward in ease of use. This was achieved by transforming a large-aperture f/2.8 300mm lens into a zoom lens that allows you to determine the picture composition you want without having to change your vantage point. It has two SLD (the special low dispersion) glass elements in front group and another element of SLD is being used for rear group for excellent correction of chromatic aberration. It exhibits excellent imaging capability like a prime lens. The AF drive for Sigma SA, Canon and Nikon cameras is equipped with a silent, fast and responsive Hyper Sonic Motor (HSM), which also provides full-time manual focus function. High-speed focusing is possible when this lens is used with dedicated APO EX tele-converters (1.4x and 2x). By adding an APO tele-converter, which is sold separately, you can use this lens as a 168-420mm f/4 AF tele-zoom lens with a 1.4x tele-converter, or as a 240-600mm f/5.6 AF ultra-telephoto zoom lens with a 2x tele-converter. It is also possible to use AE (Automatic Exposure) function, even EX Tele-converters are attached to the lens. This is one amazing lens! It delivers the performance of 300mm f2.8 prime, with the added benefits of zoom. If you are a sports photographer, don't miss this one. The optic performance is fantastic. It may not be as sharp as the best prime, but it's definitely among the sharpest zoom. The only issue I have is the collar position. It's too short and too close to the body. It requires some extra care to mount and unmount on to the monopod. This is a unique lens available only from Sigma. The lens is fast, versatile, and equipped with an internal Hyper-Sonic Motor) for auto focus. The 120-300 offers all the speed and length of 300 F2.8 primes, with the added bonus of being able to zoom out for a bit of framing versatility. The lens weighs in at over five pounds, which is about the same weight and size as most 300 F2.8 primes, so there is little compromise in portability. The lens comes with a leather boot lens cover and a lockable bayonet lens hood. The lens is sharp but loses some color saturation from the name brand primes. The HSM focusing is quite fast, and rivals AFS lenses. This lens is very useful in action shooting as you can frame the subject without losing reach, aperture, or AF speed. Like all long, fast lenses, this Sigma is equipped with a tripod collar. I am not impressed with its location or size. The collar is too small and located too far back from the front element. Even when the lens is mounted on the heavy F5, the lens wants to tilt the tripod head forward. The foot is also quite small and a larger footprint for added grip on the tripod head would be nice. Also irksome is the very stiff zooming ring. You have to put significant torque on the lens ring to zoom the lens in and out. The focusing scale is un-numbered except at the extremes of the focusing limits which is an unique and unwelcome feature of this lens. The lack of markings makes manual flash work all but impossible with this lens. The final negative issue I have with the lens is filtering. The front element is 125mm in diameter and the lens does not have a rear-mounted filter drawer like most 300mm primes. Filtering this lens will be very expensive and limited. In the end, if you need a fast 300mm, with the versatility of a zoom, and much less then the name brand 300 primes, this is a fine choice of lenses, but be aware of its limitations. Sigma scores another coup with a unique lens unavailable from any other manufacturer. The 120-300/f2.8 is a real gem for sports photographers, as it combines the advantages of the traditional staples of sports photography: the 80-200 and 300 f2.8 lenses. My sample's lens mount worked itself loose in the middle of a shoot after just a few weeks' use. A small screwdriver now packs with all my gear for simple but annoying repairs of this occasionally recurring problem. Also works quite well with Sigma's 1.4x teleconverter.